Today, the State Department Office of Inspector General announced that an investigation into Environmental Resources Management’s (ERM) conflicts of interest would not be completed until January 2014. This announcement indicates that the Keystone XL pipeline decision is facing another delay as a result of ERM lying to the State Department about its connections to TransCanada, the company hoping to build the pipeline. The Checks & Balances Project and 10 other organizations, called on the Inspector General in April to launch an investigation into ERM’s conflicts of interest. In government documents, ERM claimed that it had no relationship with TransCanada or any other entity with a stake in the project “in the past three years” despite working for TransCanada and other oil companies with a stake in the Canadian tar sands. Unredacted documents revealed proof that ERM had worked for TransCanada during that three year period and lied to the State Department on conflict of interest disclosure forms. In late May, after receiving a call from a Special Agent at the Office of Inspector General, The Checks & Balances Project announced that the State Department had launched a probe into conflict of interest allegations. WASHINGTON, D.C. – The company hired by the State Department to review the environmental impact of the Keystone XL tar sands pipeline lied on its conflict of interest disclosure form about its work for pipeline builder TransCanada and other oil companies, according to research released today by Friends of the Earth and The Checks & Balances Project. On its conflict of interest disclosure forms, ERM lied to the State Department about not working with TransCanada. In fact, ERM and TransCanada have worked together at least since 2011 on another pipeline project in Alaska. ERM lied again when it said it had no relationship with any business that would be affected by construction of the Keystone XL, which would carry tar sands oil from northern Alberta to refineries on the Gulf Coast. In fact, ERM’s own publicly available documents show that the firm has business with over a dozen companies with operating stakes in the Alberta tar sands. In recent weeks, as calls grew louder for an investigation of the numerous conflicts of interest tainting the State Department’s handling of the Keystone proposal, an ERM employee tried to cover up his work for the Alaska Pipeline Project, a partnership between ExxonMobil and TransCanada. Hammond said ERM’s lies call into question the entire Keystone XL environmental review process. Friends of the Earth and The Checks & Balances Project have called for an investigation by the State Department’s Inspector General into how ERM was hired given these conflicts of interest. 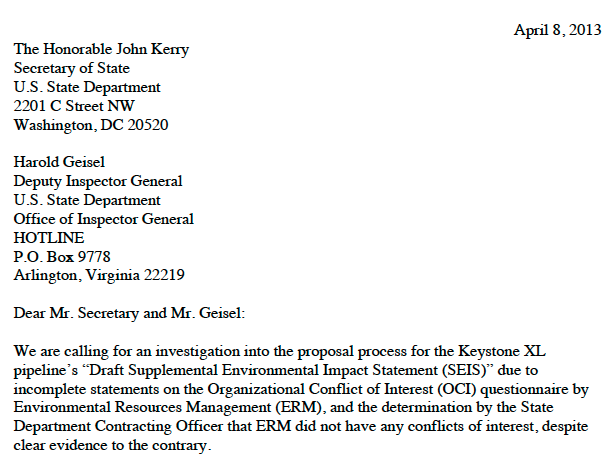 In the wake of the new evidence that ERM lied on State Department disclosure forms, the groups are asking Secretary of State John Kerry to throw out the ERM study and not allow it to determine the Obama Administration’s decision on whether to issue a pipeline permit. In papers filed with the State Department in June 2012, ERM certified that it had “no existing contract or working relationship with TransCanada” for at least three years. But public records show that TransCanada, ERM and an ERM subsidiary, Oasis Environmental, have worked together at least since 2011 on the Alaska pipeline project. 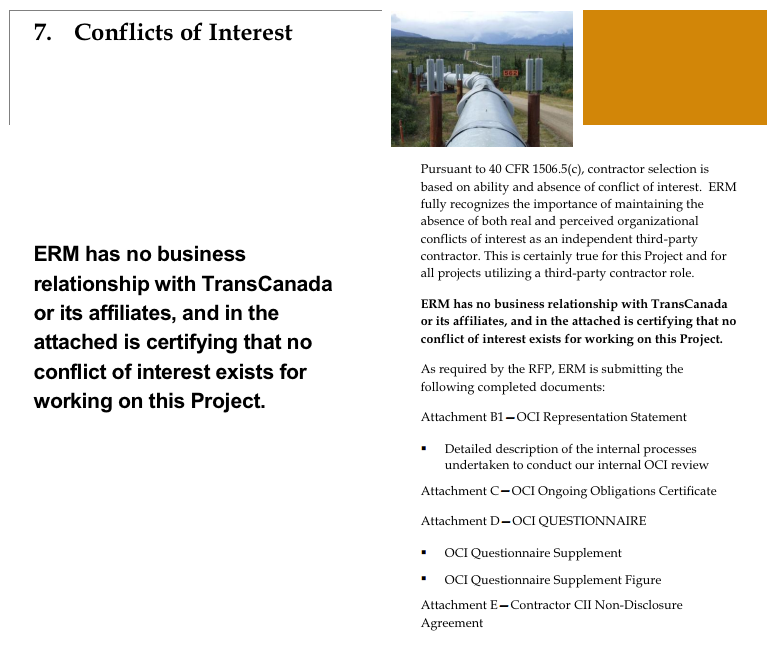 On its conflict of interest form, ERM also certified that it had no “direct or indirect relationship … with any business entity that could be affected in any way by the proposed work.” But ERM’s own publicly available documents show that in the period 2009-2012 the firm was working for over a dozen of the largest energy companies involved in the Canadian tar sands which stand to benefit if Keystone is built, including Exxon, Shell, Chevron, Conoco Phillips, Total and Syncrude. More recently, on May 14 the LinkedIn profile for Mark Jennings listed him as Socioeconomic Advisor for ERM. Among his roles for the company were since 2011, “Consultant to ExxonMobil Development Company for the Alaska Pipeline Project,” for which Exxon and TransCanada are partners. But less than a month later, his LinkedIn profile made no mention of his work for ERM. The State Department’s review of Keystone XL has been sharply criticized by the EPA and the scientific community for failing to consider the climate and other impacts of the pipeline. The Checks and Balances Project and Friends of the Earth said it is impossible for the State Department to fairly evaluate whether the pipeline is in the national interest when its environmental review was conducted by a company with deep ties to the oil industry. In yet another investigation into the Obama Administration’s activities, the State Department Inspector General is probing the conflicts of interest surrounding the contractor that performed the Keystone XL review,. The American public was supposed to get an honest look at the impacts of the Keystone XL pipeline. Instead, Environmental Resources Management (ERM), a fossil fuel contractor, hid its ties from the State Department so they could green light the project on behalf of its oil company clients. Hiring an oil company contractor to review an oil pipeline that its clients have a financial interest in should be illegal – and it is. The Federal Government has strict laws to avoid conflicts of interest and prevent the hiring of contractors who cannot provide unbiased services. Unredacted documents from the contractor’s proposal (revealed by Mother Jones) show that the company had worked for TransCanada, ExxonMobil and other fossil fuel companies that have a stake in the Canadian Tar Sands. But, ERM misled the State Department at least twice in its proposal (see C&BP’s original post on ERM’s conflicts of interest)– which may have led to its selection by the State Department to review the Keystone XL pipeline. First, ERM answered “No” to the question “Within the past three years, have you (or your organization) had a direct or indirect relationship (financial, organizational, contractual or otherwise) with any business entity that could be affected in any way by the proposed work?“ ERM appears to have added to the Yes/No questionnaire that, “ERM has no existing contract or working relationship with TransCanada.” Regardless of the addendum, the oil company contractor misled the State Department by checking “No” to the specific question above. Despite the fact that unredacted documents show that ERM worked for TransCanada and other fossil fuel companies with a stake in Keystone XL pipeline in the three years prior to its proposal. Second, ERM claimed it was not an energy interest. The State Department question defines an energy interest in part as any company or person engaged in research related to energy development. Yet, ERM has worked for all of the top five oil companies and dozens of other fossil fuel companies. In other words, ERM is clearly an energy interest. How can we trust ERM to perform an honest review of the Keystone XL pipeline, if it can’t answer a yes/no question honestly? These misleading statements should have been flagged by the State Department and the contractor should not have been able to perform the review because of these seeming conflicts of interest. Because of the issues above, Checks & Balances Project (C&BP) and 11 environmental, faith-based and public interest organizations sent a letter [.PDF] on April 8, 2013, calling on Secretary of State John Kerry and the State Department Deputy Inspector General Harold Geisel to investigate two things: first, whether ERM hid conflicts of interest which might have excluded it from performing the Keystone XL environmental assessment and second, how State Department officials failed to flag inconsistencies in ERM’s proposal. Hello Mr. Elsner, my name is Special Agent Pedro Colon from the State Department’s Office of Inspector General. I’m calling to inform you that we have received your request and are reviewing the matter. If you have any questions please contact me at 703-284-2688. On May 7, 2013, I called Special Agent Colon but he was unable to speak at the time. I followed up the next day and spoke with the Special Agent via phone regarding the request for an investigation. I asked a few basic questions about the status of the complaint and asked specifically if C&BP would be informed should the complaint be fully investigated by the Office of Inspector General (OIG). Special Agent Colon informed me that he could not speak to any of the questions and referred us to other staff in the OIG. If the hotline is moved out of the review process and onto the next step (an investigation? ), will I be notified? The OIG replied via email saying that the OIG Office of Investigations will not comment if it is engaged in an investigation. The correspondence between C&BP and the OIG indicates that there is a probe into the Keystone XL review conflicts of interest. The public was supposed to get an honest look at the impacts of the Keystone XL pipeline. Instead, ERM, an oil company contractor, misled the State Department, in what appears to be an attempt to green light the project on behalf of oil industry clients. The American Public needs a full investigation into the conflicts of interest and misleading statements of the Keystone XL review contractor, Environmental Resources Management. Secretary Kerry needs to stop the Keystone XL process until the Inspector General completes a full investigation of these conflicts of interest and the State Department has an unbiased review of Keystone XL’s impact. Yesterday, Checks & Balances Project and 11 environmental, faith-based and public interest organizations called on Secretary of State John Kerry and the State Department Deputy Inspector General Harold Geisel to investigate whether Environmental Resources Management (ERM) hid conflicts of interest which might have excluded it from performing the Keystone XL environmental assessment and how State Department officials failed to flag inconsistencies in ERM’s proposal. Tom Zeller, Senior Writer at The Huffington Post, wrote an article highlighting the letter callings for an investigation. Early last month, the State Department released a 2,000 page environmental impact study for the Keystone XL pipeline claiming that the pipeline would not have major impact on the environment. But, Environmental Resources Management (ERM), the consulting firm hired to perform the “draft supplemental environmental impact statement (SEIS),” has ties to fossil fuel companies with major stakes in the Alberta Tar Sands. This conflict of interest was not accurately disclosed in ERM’s answers on a State Department questionnaire. Checks & Balances Project considers ERM’s responses in its proposal to be intentionally misleading statements. The unredacted biographies show that ERM’s employees have an existing relationship with ExxonMobil and worked for TransCanada within the last three years among other companies involved in the Canadian tar sands. 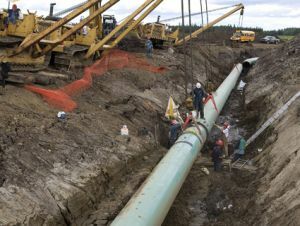 “ERM’s second-in-command on the Keystone report, Andrew Bielakowski, had worked on three previous pipeline projects for TransCanada over seven years as an outside consultant. He also consulted on projects for ExxonMobil, BP, and ConocoPhillips, three of the Big Five oil companies that could benefit from the Keystone XL project and increased extraction of heavy crude oil taken from the Canadian tar sands. When asked about who at the State Department decided to redact ERM’s biographies, a State Department spokesperson said “ERM proposed redactions of some information in the administrative documents that they considered business confidential.” Disclosing past clients may be business confidential information, but from what the biographies show, ERM may have recommended the redactions to hide conflicts of interest from public disclosure. The biographies on ERM’s proposal show that the company has had direct relationships with multiple business entities that could be affected by the proposed work in the past three years. Regardless of the addendum Koster added, he still submitted an incomplete statement when checking “No” to the specific question above. Simply put, the information provided by Mr. Koster was an incomplete statement if one simply reviews the biographies of ERM’s employees for the project. The State Department Contracting Officer should have flagged this inconsistency when reviewing the staff biographies. ERM’s answers did not properly reveal in the Yes/No questionnaire that ERM did have a current “direct relationship” with a business enetity that could be affected by the proposed work and a relationship in the past three years with TransCanada, the company building the pipeline. Koster’s incomplete statement on direct business relationships is not the only odd statement in ERM’s proposal. ERM also answered “No” to the question, “Are you (or your organization) an ‘energy concern?’” which the State Department defines (in part) as: “Any person — (1) significantly engaged in the business of conducting research…related to an activity described in paragraphs (i) through (v).” Paragraph (i) states: “Any person significantly engaged in the business of developing, extracting, producing, refining, transporting by pipeline, converting into synthetic fuel, distributing, or selling minerals for use as an energy source…” ERM as a research firm working for fossil fuel companies is, unequivocally, an energy interest. So the question must be asked: If ERM is unable to accurately fill out a simple questionnaire regarding conflicts of interest, how can we trust the company to perform an unbiased environmental assessment of a 1,179 mile-long pipeline cutting through the American heartland? And, why did the State Department’s Contracting Officer not flag the inconsistencies in ERM’s Conflict of Interest Questionnaire when reviewing the proposals? The Federal Government has strict ethics rules to prevent Organizational Conflicts of Interest (OCIs) from impacting the impartiality of government contracts and to prevent hiring contractors who cannot provide independent and unbiased services to the government. According to current collateral requirements, contractors must be found “nonresponsible” when there are unavoidable and unmitigated OCIs. Checks & Balances Project believes that the Contracting Officer should have deemed ERM “nonresponsible” because the company serves as a contractor for major fossil fuel companies that have a stake in the Keystone XL pipeline. If ERM were “nonresponsible”, the company would have been ineligible to perform the environmental impact review of the Keystone XL pipeline. These potential material incomplete statements on a Federal Government proposal calls into question the integrity of ERM and threatens millions in government contracts. Certainly these incomplete statements call into question both the independence of ERM and the judgement of the Contracting Officer in making the “affirmative determination of responsibility.” This proposal process should be investigated by the State Department Inspector General to determine if ERM’s statements are cause for exclusion. We believe ERM used multiple material incomplete statements and had clear conflicts of interest as shown in the unredacted documents. So, why was ERM hired by the State Department? Checks & Balances Project asked a State Department spokesperson about the conflicts of interest and the spokesperson said: “Based on a thorough consideration of all of the information presented, including the work histories of team members, the Department concluded that ERM has no financial or other interest in the outcome of the project that would constitute a conflict of interest.” Perhaps the State Department’s Contracting Offier made the decision to hire ERM because of the company’s incomplete statements on the conflict of interest questionnaire. Checks & Balances Project along with 11 other groups (Better Future Project, Center for Biological Diversity, Chesapeake Climate Action Network, DeSmogBlog, Forecast the Facts, Friends of the Earth, Greenpeace, NC WARN, Oil Change International, Public Citizen’s Energy Program and Unitarian Universalist Ministry for Earth) sent a letter to Secretary of State John Kerry and the State Department Deputy Inspector General Harold Geisel calling for an investigation into the matter. These incomplete statements and the determination by the Contracting Officer that ERM did not have any conflicts of interest, despite clear evidence to the contrary, are grounds for further investigation. Environmental Resources Management (ERM), the consulting firm hired to perform the supplemental environmental analysis of the Keystone XL pipeline works for and has worked for fossil fuel companies with a stake in the Canadian Tar Sands. Mother Jones’ Andy Kroll exposed the conflicts of interest in an exclusive story, which included unredacted documents that show the recent work history of ERM’s consultants. XL pipeline would not lead to an increase in greenhouse gas emissions or significantly impact the environment along its route. pipeline caused enormous environmental damage and failed to live up to the jobs hype created by the project developers, which included BP, State Oil Company of Azerbaijan (SOCAR), Chevron, ConocoPhillips, Eni and Total. So why does ERM operate more like a PR firm than an environmental consultancy? Let’s say ERM provided a review claiming a fossil fuel project was skirting safety precautions or moving too quickly to ensure quality seals on the pipeline (see Keystone XL’s faulty welding here). Would a fossil fuel company, whose financial interest is building more fossil fuel infrastructure, want to hire a consultant that results in delays and increased costs for developing that infrastructure? Checks & Balances Project contacted ERM’s Global Head of Communications Simon Garcia multiple times over the past week without any response. We requested comment on the following question: Has ERM ever determined that a proposed fossil fuel project was not “environmentally sound” in an assessment?